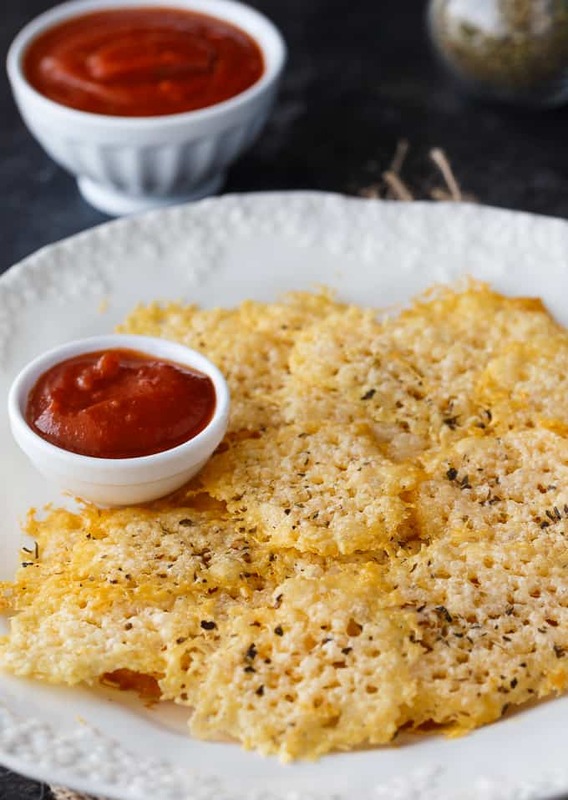 Parmesan Crisps are the perfect low carb snack! I love making them because they are easy to whip and are guilt-free. I find low carb diets work the best for me to lose weight. I’m not stranger to one ingredient recipes. My recipe for Cheese Chips is similar, if not the exact same! The only difference is that I used Parmesan cheese instead of other types of cheese like cheddar or mozzarella. Parmesan Chips have a delicious bite of flavour that only Parmesan cheese can offer. I recommend you buy a block of Parmesan cheese versus a pre-grated can you can find in the pasta aisle. When you are making these low carb chips, fresh is always best. The beauty of this recipe is how easy they are to make. 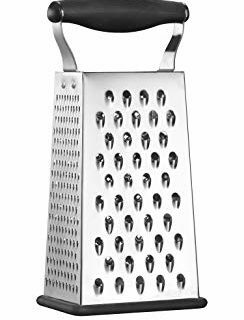 Shred the cheese on the finest grate your cheese grater has. 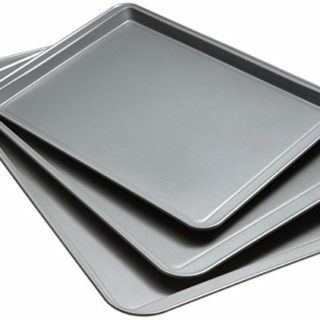 Place a piece of parchment paper on a baking sheet. Then, add a heaping tablespoon of grated Parmesan cheese to the baking sheet. Make sure you space them apart so they don’t melt together and you have one big chip. Been there, done that. I also sprinkled on Italian seasoning, but that is completely optional. I liked the little bit of extra flavour it adds. It also makes them look more interesting. Bake them in the oven for 5 minutes at 375F. You’ll need to stick close by because if you forget them in there, they will burn quickly and the flavour will be off. They should be slightly golden. Once you remove them from the oven, carefully slide each chip onto spatula and transfer to your serving plate. I like them best served fresh, but they will be fine if you need to leave them sit for a bit while you make the other batches in the oven. Let’s talk dipping sauces! 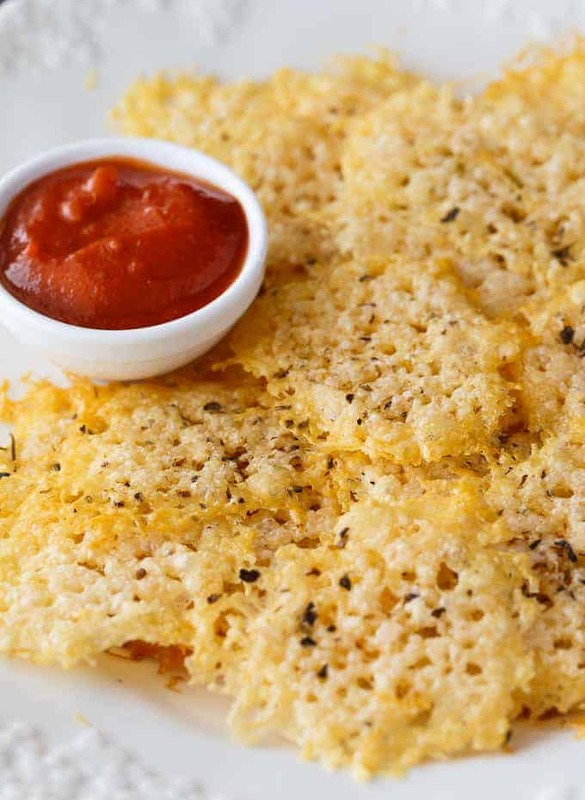 This Parmesan Crisps recipe is perfect for dunking. My favourite dipping sauce is a can of pizza sauce. I put the pizza sauce in little dipping dishes and place them alongside the cheese crisps. If you’re alone, double dip all you want, but while enjoying with others, just don’t. My preference is to enjoy them hot and fresh out of the oven, but I know that is not feasible sometimes. If you are planning a party and want to prepare them ahead of time, you can. Just store them in an airtight container with wax paper between each cheese crisp until you are ready to serve. I wouldn’t store them any longer than two days though. Since you can freeze Parmesan cheese, you’ll also be able to freeze this recipe. Make sure to store them in a freezer safe bag or container. I wouldn’t store them any longer than two months. Parmesan Crisp Bowls. Get fancy and make Parmesan Crisps bowls with the help of a muffin tin. Follow the recipe as directed and then once out of the oven, place the cheese crisp over an upside muffin tin. It will mold into the same of the bowl. You can fill it with Caesar Salad. Yum! Low Carb Croutons. Skip the croutons and make a low carb salad with broken up pieces of baked Parmesan instead. Sandwich. Use two Parmesan Crisps as your bread and put your favourite savoury sandwich fillings inside. Soup. Add one to a bowl of piping hot soup and enjoy the extra cheesiness. The possibilities are endless! Be creative and have fun with this simple recipe. I made this recipe recently when I had a few friends over. Everyone was exclaiming just how good they were and they couldn’t believe how easy they were to make. The whole platter was devoured within minutes. Furthermore, I had a few people ask for the recipe and I said that it really wasn’t a recipe because of how simple they are to make. I’ll take Parmesan Chips over regular potato chips any day! For more delicious low carb recipes, try my Bacon, Spinach & Mushroom Crustless Quiche, Spicy Egg Muffins, Buffalo Popcorn and Chicken and Egg Ramekins. I also highly recommend Suzanne Somers’ books on low carb diets. I lost 70 lbs before with her help! Reading her books again is on my to-do list for a quick refresher to get back on the weight loss wagon. I’m ready for a change. 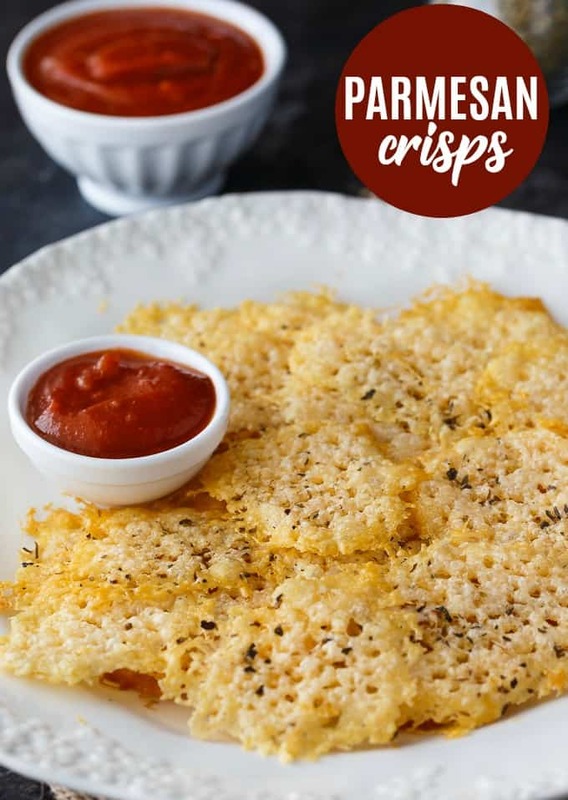 I’d love to hear what you thought of these Parmesan Crisps! If you try them, leave me a comment and let me know how you liked them. The perfect low carb snack! This easy recipe is guilt-free and delicious. Enjoy as an appetizer, in soup or salads or even as the bread for your sandwich. Add about 1 tablespoonful of Parmesan cheese to baking sheet. Make sure to space far enough apart so there is no overlap. Sprinkle Italian seasoning on top. Bake for 5 minutes. Remove with a spatula to a serving platter. These sound so yummy–I’ll have to try them soon! They look so good, and sound even better! I have the cheese, just need to get some pizza sauce! Thank you! Oh my gosh these sound delicious! I am going to make these for sure. My mouth was watering just reading about it. Thank you so much! I can’t wait to try these. They look delicious. I’d love these I’m sure, oh well I can always make them when I’ve finished my diet. This looks like a very tasty recipe. I want to try it and share it with my friends and family. I love Parmesan cheese so this is a great recipe for me plus I love how easy it is. Yum! I’d love to try these!!! I want these riiiiight now! My wife loves these. I have never thought of putting herbs into the cheese or dipping them, love the idea. These sound terrific. I think they would be excellent with marinara. Like you I do best low carb, and these would satisfy yet be not so bad at all. I think the addition of the seasonings would taste good. I’ve never had these but they sound so amazing! PINNED! 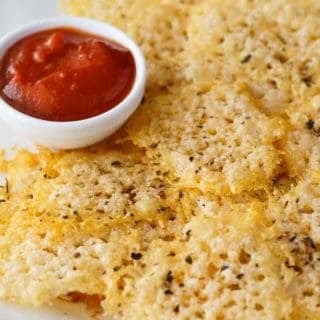 Parmesan crisps are so delicious! I had to make them every morning when I was working as a prep cook and I would always sneak one and eat it myself while they were still warm. So good. But for some reason, I’ve never thought to make them at home. Thanks for reminding me of this delicious treat! 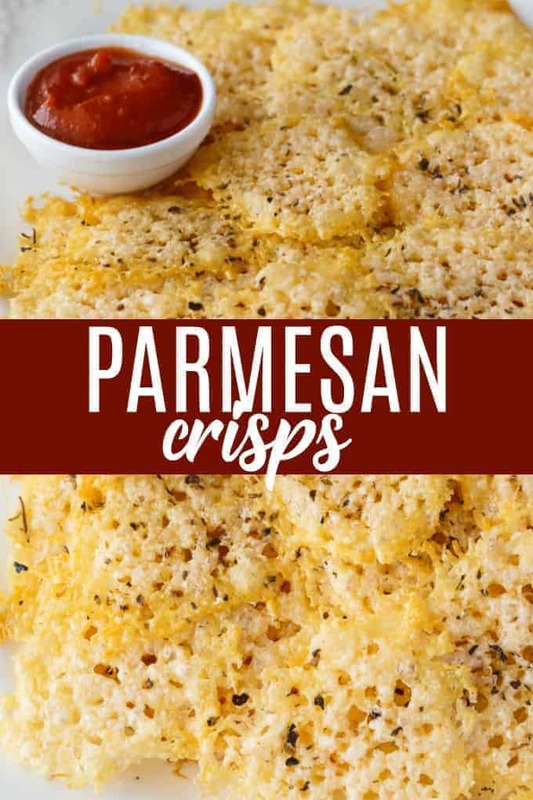 Your Parmesan Crisps are great, I love using these with a salad! Thanks so much for sharing with us at Full Plate Thursday for the party this week. Hope you have a great week and come back to see us real soon! I keep meaning to try these. Block cheese is always better than pre shredded cheese. This looks awesome! My mouth is watering just looking at these pictures! This looks amazing!!! I’m always on the lookout for low carb snacks. I can’t wait to try these. Thanks for sharing at Merry Monday! Hope to see you at the party next week!